[Fate/kaleid liner Prisma☆Illya 3drei!!] returning collaboration event continues. During this event, there will be increased resume rates for the Collaboration Employees according to the following schedule. 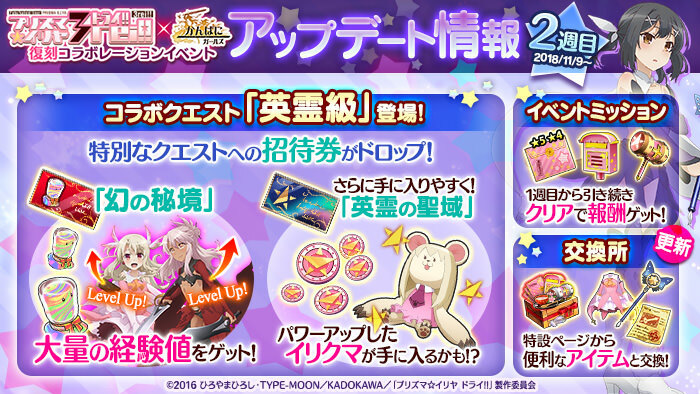 ※ The above employees will only appear during the [Fate/kaleid liner Prisma☆Illya 3drei!!] returning collaboration event and will have increased resume rates. ▼ Collaboration Quest [Hero Rank] appears! In the collaboration quest [Hero Rank] difficulty, the [Limited] [Unexplored] Invitation Ticket which was only available from certain distribution times may drop. The [Limited] Hero's Sanctuary Invitation Ticket can also be more easily obtained. The [Limited] ★5・4 Prisma☆Envelope which guarantees a ★4 or higher collaboration employee, and the [Limited] Prisma☆Hammer+ which can easily craft +3 weapons for [Illya], [Miyu], and [Kuro] have been added to the shop. The following itemshave had their purchasing limit increased. ▼ Daily appearing [New President Support Quest] continues! A new daily [New President Support Quest] will appear every day. There is also an item available for purchase in the collaboration exchange shop with 1x [Limited] ★5・4 Black Envelope and 1x [Limited] [Unexplored] Invitation Ticket and other useful items inside. Fixed parameters for [Sen]'s Department Chief career up. Fixed a bug where Collaboration Employee [Shiro]'s exclusive skill [...check...mate] would not correctly activate its [PATK Down] effect. Last edited by Folseus; 11-09-2018 at 09:58 AM.